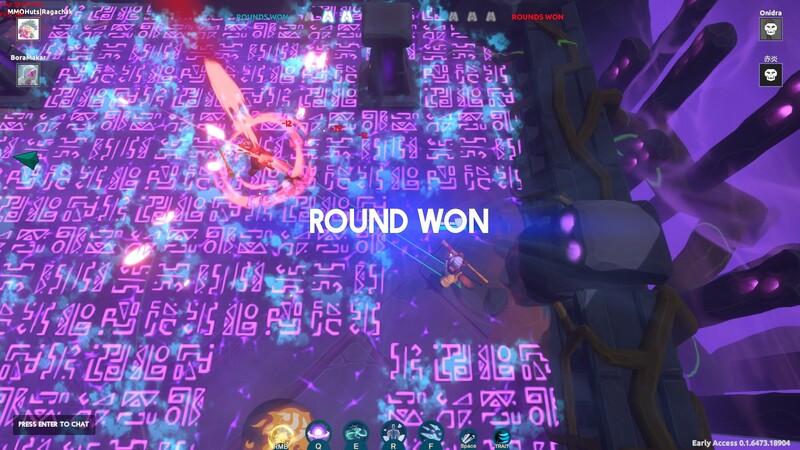 Blast Out is an interesting creature. It’s an arena brawler that features a 2-on-2 system where you also have to contend with the primal forces of nature and magic! As the matches proceed, a plethora of environmental hazards appear, but there’s thankfully a timer in the top middle of the screen that offers a warning when something is about to happen. 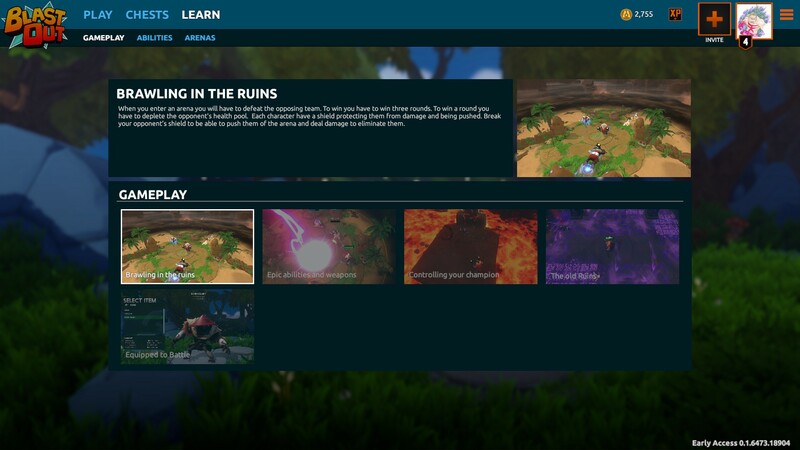 It doesn’t say what, but as the match loads, it does offer a minor warning, whether it’s the giant glowing runes, or parts of the map being engulfed in lava. Being aware and constantly on the move is paramount. 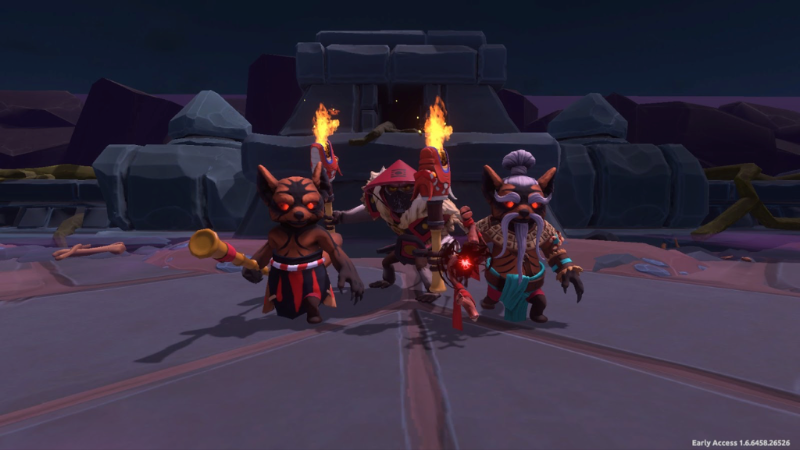 Instead of playing specific legendary heroes, champions, or notable figures, you play as a character in one of three races (at least in the current build). You equip them in gear that alters their stats, and select their abilities out of an open pool of abilities, configured to your specifications. From there you go into battle, and the first to win three rounds (so best of five) wins the day and collects the spoils of war! Stats Matter, but “Epic” doesn’t mean “Better”. Pick what you need, not based on color. The three character races are Mapache (Red Panda, known as Catbears by some of the other races, cunning tricksters), Chinpanji (Ape, peaceful monks and practitioner of Apashite Kung Fu), and Bjorn (Bears, down-to-earth Northerners, fond of ale and fancy beards). 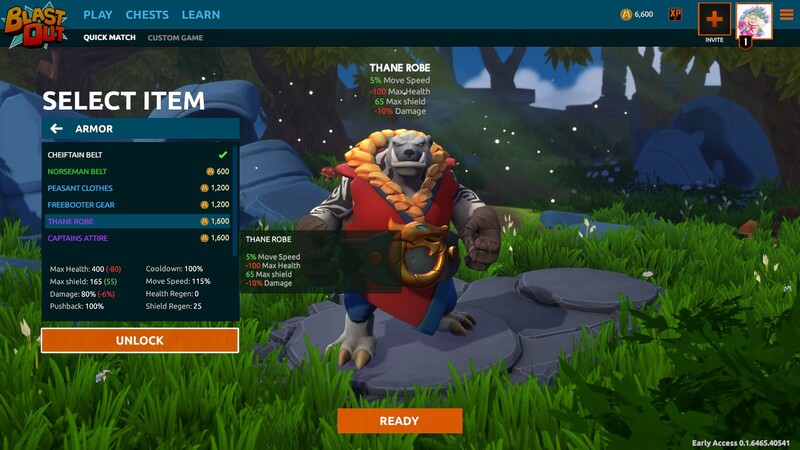 Each character has its own stats, from Cooldown Percent, Move Speed, Health, et cetera, but you can adjust these stats as you purchase gear/unlock it in the Chests. This gear can only be bought with Coins, which you acquire from Chests and through gameplay. I received chests that contained Coins even in a loss. Winning gives a better Chest, which can give you powerful weapons to equip. More on that in a bit. Each character has its own particular armor that it can equip, which changes their look, and their stats. The rarity of them is the standard Green, Blue, Purple, Orange from lowest to rarest. The thing that I like about this gear is that not a single piece in the entire game has “only” bonuses/buffs. For every positive stat like +2 Shield Regen, it will have something like -100 health to balance it out or -7.5% to your damage, but lowers cooldown by 14% The stats seem to match each other, so you can balance the style with what stats you feel are appropriate. Sometimes you have to know when to run or when to pop powers. You start with one weapon, which you use with your mouse. It has a basic attack which you can use instead of your selected skills. 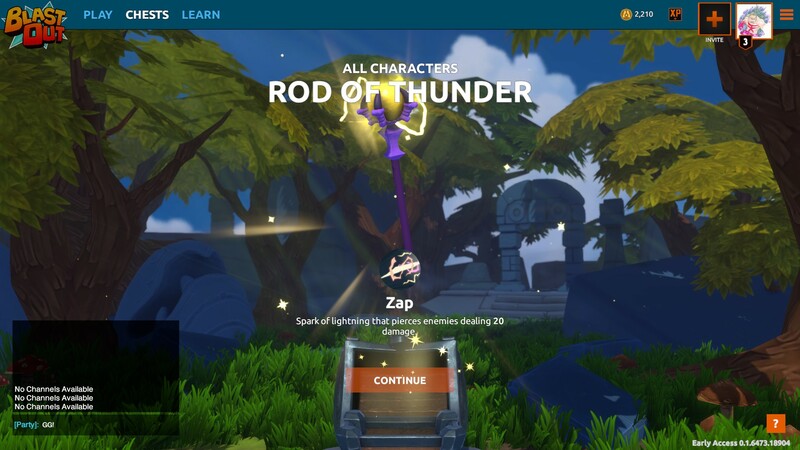 As you win matches, you get a special chest that can unlock legendary, more powerful weapons. These cannot be bought, they are only earned through victory. So far I have a few of them, and they have targeted powers like shooting a fireball or launching a bolt of lightning across the screen. As you activate a weapon or skill, a line, circle, or other shot marker will become available, but I do appreciate that it has Smart Cast and Quick Cast. Smart Cast casts the ability when you let go of the key, and Quick Cast is when you hit the key. I’m also very glad you can adjust where you cast abilities, which is common but appreciated. For this game, I think it’s a little awkward to use WASD to move and QWERF to use powers. Pick who you want, then worry about abilities. As someone who uses a Razer Naga, I started to use my powers with my Naga’s number pad. That just works better for me. 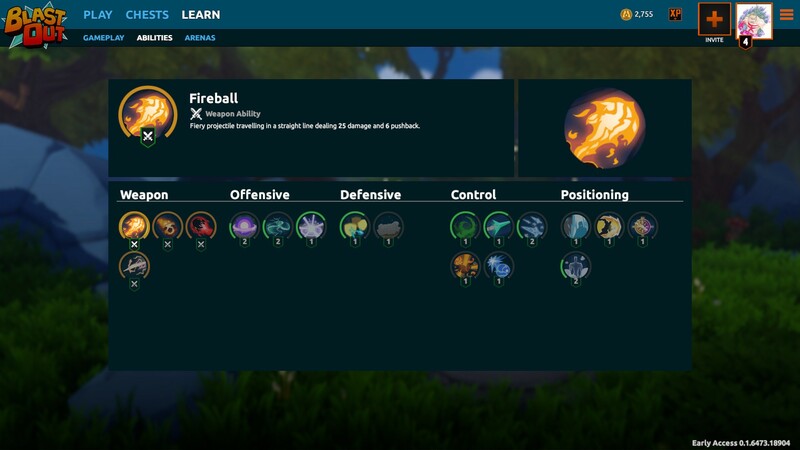 Speaking of abilities, you have a pool of 28 different abilities, in the following categories: Weapon (What your Weapons do), Offensive (Attack Skills), Defensive (Protective), Control (Crowd Control), and Positioning (Charging, Dodging, Teleporting). The great thing is you can use whichever you want. Want to just be a CC/Position machine for your friend who stacks Offensive/Positioning powers? Then, by all means, do it! As you use these powers, they level up, but this is where I started to get worried. I had no idea what the purpose of the ‘level’ was at first and feared the abilities would get stronger. Leveling skills give you coins and an alternate version of the ability. Not a “better” one, just a “different” one for you to try out. So the ability to customize, change and build a loadout for any situation is great. You have 100 seconds to plan it before the match starts, so use it wisely. I would very much like to get Loadouts for this game though, so I can make loadouts for certain teammates or maps to just be prepared for any situation. It’s not a necessity, given how much time they give you, but it would cut some of that wait and get us ready to jump right into battle. Each one of those glowy spots is DOOM. Blast Out is a game that is heavily reliant on skill though. No skill set is going to save you from a loss if you don’t know what the map does, or what your opponents can do. And with the Knockback system, knowing how and when you can knock someone back will definitely give you the edge. Why is that? Remember all those horrific elements of the map? There are times when most of the map is covered in doom, from fire or runes of magic, et cetera. 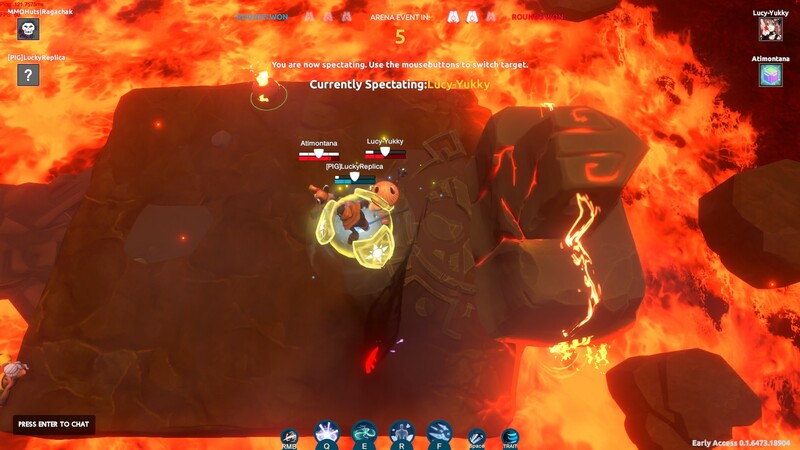 When they’re right about to show up, or are appearing, if you can knock an enemy deep into the lava, they might not have the cooldowns to get out! Or you can just root them deep into the lava like I do. It’s a game that requires not only personal skill but teamwork. So being able to duo-queue and chat on Discord/Skype/etc will definitely be better than typing in the chat box. Sure, it’s useful and I’m glad it’s there, but being able to play with friends and coordinate will put you heads and tails above anyone else. Haunted Temple: Vengeful Spirits (They randomly haunt tiles on the map), Thoughtful Spirits (These light up before they strike you), Spirits Everywhere (More spirits every time they return). This is a pretty simple game from the outset, but there’s so much really going down. Sure, it’s two-on-two with only a few maps, but there is so much customization, and you have plenty to worry about. Just because you play the same map twice, it will not be the same experience twice, and that’s what’s so damn wonderful about it. I’m hoping more characters and maps will be on the way, and I definitely can tell it’s inspired by the Warcraft III “Warlock” mod. It’s something I read in a press release, and as someone who spent a lot of time on WC3 modes as a younger man, I can feel it. The maps constantly change over the course of the map so a strategy that works in the first match might not work in the second match. It boils down to personal skill, a bit of luck, and a lot of being able to react to whatever is going on around it. It’s fast-paced, non-stop action. Use the passive trait your character has mobility powers, and the skillset you chose to your advantage on each map. That’s one of the many things I love about it. It’s crazy, adrenaline-inducing fun. And it has LOTS of tutorials and guides on what to know. I do kind of feel like three matches to a win is a bit much though. I’d prefer being able to set that if I want sudden death, or two out of three, et cetera. You can’t enter Custom Mode yet, so maybe those options will there. Or at least, I wasn’t able to enter it at the time of writing. I stand by wanting controller support though. I think it might make the game a little harder, but I think arcade brawlers like this can be improved with having it as an option or at least test it during Early Access to see how it’s received. It’s not pay-to-win in that every piece of gear has a downside with an upside, you can build your character any way you want so you don’t have to stress your opponent having some OP kit that you don’t have access to. And if you see someone doing something incredible, you can try it out for yourself. Blast Out is crazy fun, and I’m looking forward to seeing some insane maps come to this. Some ideas I thought of were an underwater map where everything is slowed down, maybe throw in some giant sea creatures, or something up in the sky where you can plummet to your doom. Could be a great sudden death map, or something for casual fun. Dunking people and defeating them in combat has not felt this satisfying in a very long time.